I can’t believe it’s Pi Day again already! 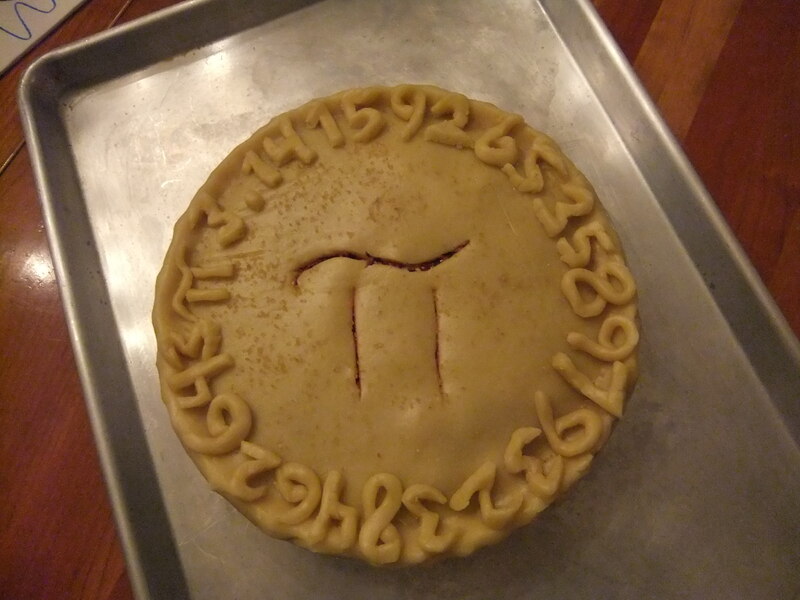 In honor of this, my favorite geek holiday, I’m reposting my Pi Day Pie blog that I ran last year. #3 just came running in to remind me that we need a pie for tomorrow. A few weeks ago she gave me a sheet from her math class. It was about Pi Day (March 14) celebrations, and they were asking for, among other things, some pies. 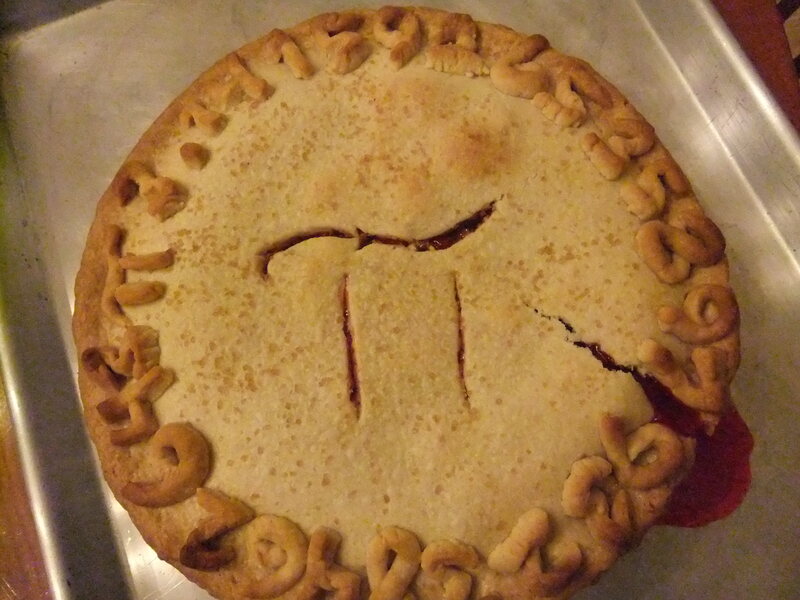 Last year I saw a picture of the most badass Pi Day pie ever made. I just searched Google images and can’t find it, which can only mean that I must know the person who made it and saw the picture on Facebook. It was homemade, crust and all, with the symbol Pi cut out of pie crust and placed on top in the center, and then the numbers cut out of pie crust, placed all around the edges of the pie. This was the first I’d ever heard of celebrating Pi Day. I was an instant believer. I am a geek at heart and that pie thrilled me. This memory is what welled up in me when #3 handed me her math sheet, and it was what took over and compelled me to yes, volunteer a pie. I was going to make her a homemade pie, crust and all, and decorate it with as many decimal places of Pi that I could fit around the circumference. Then I went to Berlin and we had some crises at home and I forgot all about it until she just now came to me, and I am jetlagged and cranky and the last thing I want to do is leave the house and make a goddamn pie happen. This is what happens when I try to be a better parent. I am now off to the store to see how I can remedy this with a half-assed solution without totally crushing my geek spirit, or completely letting down #3 and her math class. I asked CC for input. (Foodies, you can stop reading here). He suggested frozen pie crusts and canned filling. Hot damn! Back from the store. I assemble the pie parts and then proceed to use an additional pie crust and cut out numbers freestyle with a blade. I am way too into this. The kids keep coming by and looking, and they comment on how cool it is and how unlike me it is. It takes a long time. I do not read #5 and #4 stories tonight like I usually do on Sundays. I do not even tuck them into bed. I am Baking a Pie. Leave me alone. I signed up to give a pie to try and be a better parent. I end up being a worse parent with a nifty pie. Nifty, except it had an accident in the baking process. The color is uneven. And it ripped, and now it looks like it’s bleeding. I had hoped that some superior mom would be envious of my pie and erroneously attribute me mad parenting skills. That was before my Pi pie turned into sweet vampire protection. Posted on March 14, 2012 by JM RandolphPosted in #3, Bad Parenting, Ha, The Heathens, YumTagged dessert, food, Ha, JM Randolph, kids, math, pi, pi day, pie, step parenting. Is it OK for a Pi Day cake or pie to be square? This sounds like something you should draw. I got Eats, Shoots & Leaves, by the way, and I’m loving it.Thanks for the recommendation! Also, your excitement for Pi Day rivals that of my excitement for February 1, 2112, an equally geeky, but far less frequent, holiday. I listened to a lot of Rush on 2/1/12, but alas, there was no pie. This makes me unbelievably happy. I did not have the wherewithal to realize it was Feb.1 when it happened. I hope you listened to enough for me! Oops, I meant February 1, 2012 (2/1/12), not February 1, 2112. Unfortunately I doubt I’ll be around for THAT celebration! AS IF I will ever bake for you, after that freaking amazing birthday cake you made me. I grow ashamed just thinking about it. I’d be bleeding too if I had that many significant digits! Nice work. Ha! I’m so glad you reposted this! I am very impressed, and most of the time, pre-made crust tastes better anyway! “I am Baking a Pie. Leave me alone.” I feel like that should be my bumper sticker on the car of life. I feel like you may need additional cars for all the bumper stickers you should have. Everything about this is too freakin’ fabulous for words, which means (I suppose) it’s a bit of a travesty I’m trying to proffer them anyway. Ahem. Not as magical as a comment from you! I love it when you come to visit! I loved Pi Day as a teacher because we’d get to eat pie with the students. We loved the homemade ones best! 🙂 It’s truly a geeky day and is enjoyable even if you’re like me and don’t like math. Pie is the universal denominator! I never considered it from a teacher’s perspective. That’s completely brilliant!